You are enjoying a ride on your Harley or other motorcycle on North Market Street in Jacksonville when a car, out of nowhere, sideswipes you. The impact causes you to suffer significant injuries necessitating a multi-day stay at the hospital and months of rehabilitative treatment. In this scenario, you may be able to pursue monetary damages against the negligent driver. A motorcycle rider is reportedly 37 times more likely to lose their life in a collision than someone riding in a sedan or SUV. In Florida, licensed motorcyclists made up roughly seven percent of the traveling public, but constituted 14 percent of all roadway deaths. There’s no doubt about it – operating a motorcycle puts you at greater risk of suffering an injury or losing your life. There are some people who are skeptical when a motorcyclist files a personal injury claim against a driver who caused a serious accident. They mistakenly think, “Hey, this person took a risk by operating a motorcycle. You are exposing your body to serious harm by operating a motorcycle on a road or highway.” By that logic, someone on a bicycle, or even a pedestrian, “took a risk” because they were exposed to greater harm when they were hit by a vehicle. If you or a loved one was seriously injured in a motorcycle accident, do not hesitate reaching out to a lawyer out of concern that you don’t have a case. If there is evidence that a driver was negligent and that negligence proximately caused your injuries, then you have legal grounds to pursue a personal injury claim. When you are involved in a serious collision, the very first step should be to seek medical attention. You need to a medical professional to examine you in order to assess the severity of your injuries. For example, some people may hit their head in a collision and forego seeing a doctor. This is a mistake because that head trauma may have caused a severe concussion or other brain injury. You should also make sure to get the other driver’s insurance information and take photos of the damage to your motorcycle. You should then speak to an experienced Jacksonville motorcycle accident lawyer because they can assist in obtaining a copy of the accident report from state police. You do not have an infinite amount of time to file a personal injury claim against the other driver. The Florida legislature enacted a statute of limitations for personal injury claims. 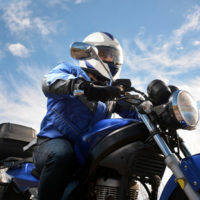 For motorcycle accidents, an injured motorcyclist has four years to file a claim against the negligent party. If you lost a loved one in a motorcycle accident, the statute of limitations for a wrongful death claim is two years from the date of their death (i.e. the date of the collision). If you or a loved one was seriously harmed in a motorcycle accident in Jacksonville, contact Gillette Law, P.A. today. Our firm is experienced in handling complex personal injury and wrongful death claims, including claims involving motorcycle wrecks. You can contact a representative online, or you can call our office toll-free at 888-366-5904 to schedule a free consultation.